On Friday, September 15, 2017, the Hurricane Junior Golf Tour traveled to Hayward, CA to host the San Francisco Jr. Shootout at SkyWest Golf Course. The players enjoyed some great weather on both days to post some great scores. Every player showed great growth, and had even more fun competing with each other on this junior friendly golf course. Akira Isayama of Palo Alto, CA is the champion of the boys 14-15 division. Akira showed off his golfing ability with great scores on both days. He posted a first round score of 77 and a second-round score of 73 for a total of 150. Alex Chen of also from Palo Alton, CA came in 2nd after finishing with a two-day total of 154 (75-79). 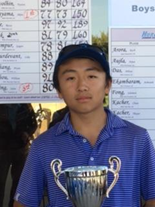 Finishing in 3rd place from Cupertino, CA was Jalen Xing after posting a two-day score of 156 (80-76). It was obvious that these players love the sport, and strive to perfect their games. Winning the boys 11-13 division from Fremont, CA was Aditya Das. 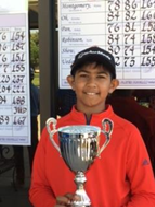 Aditya ended up scoring a 75 on Saturday and a 76 on Sunday (151). 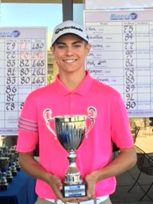 Coming in 2nd place after scoring a two-day total of 154 (78-76) was Kush Arora from Pleasanton, CA. Ashwath Ekambaram from Fremont, CA finished in 3rd with a two-day total of 155 (78-77). These players competed hard to the very last hole. All players showed how to both have fun and stay focused on developing their skills. 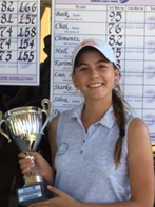 Dana Lerner of Caesarea, CA is the girls 14-18 champion. Dana had an impressive 72 on Saturday and followed it up with another 72 on Sunday (144). Finishing in a tie for 2nd from Pacifica, CA was Grace Bettis who posted a two-day total of 154 (76-78). The other 2nd place winner was Lauren Shew from San Francisco, CA after also scoring a two-day total of 154 (80-74). These players showed great determination, and never let anything stray their focus. 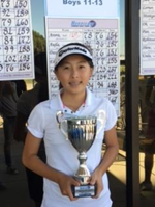 Penny Chai is the girls 13 and under champion. Chai of Alameda, CA shot consistently with a 76 on Saturday and a 75 on Sunday (151). Madison Starke of Walnut Street, CA finished 2nd after an impressive second round with a two-day total of 153 (80-73). Finishing in 3rd was Vani Karimanal after shooting a two-day total of 155 (78-77). This whole division had a lot of fun competing with one another and showed growth from each hole.